They are extremely reliable and extremely responsive. They are good cleaners and they know their business. I deal with Jeremy a lot. He is just really on top of things and a pleasure to work with. Use them and use them often. They're wonderful. I can trust them. I know that when I tell them where to clean, they do it and do a great job. They go above and beyond. They're fantastic. Everybody was responsive. They returned calls, and they showed up when they were supposed to. Good & Clean Co. Inc. provides a wide range of cleaning services for residential and commercial clients throughout the Bay Area. The company utilizes a variety of traditional and Green methods and products to clean everything from windows and carpet to tile and grout, and it also has the capabilities to offer complete janitorial services to medical facilities, restaurants, schools, churches, and other commercial establishments. DIAMOND CERTIFIED RESEARCHED CAPABILITIES ON Good & Clean Co. Inc.
Company Name: Good & Clean Co. Inc.
DIAMOND CERTIFIED RESEARCHED ARTICLES ON Good & Clean Co. Inc.
Office Manager Olivia Whitcomb keeps Good & Clean's office fully staffed so customers can always get help. Good & Clean has been providing cleaning services for residential and commercial clients throughout the Bay Area since 1996. 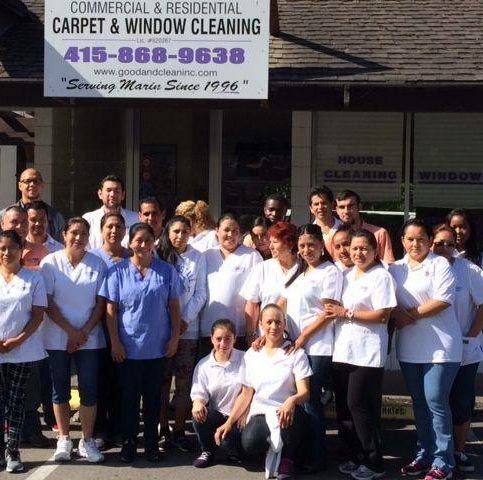 The company uses a variety of methods and products to clean windows, carpet, tile, grout, and other surfaces, and it also has the equipment and training to offer complete janitorial services to commercial establishments like medical facilities, restaurants, schools, malls, offices and churches. Take simple steps to clean the stainless steel appliances in your home. Stainless steel refrigerators, stoves, dishwashers, and other appliances have become increasingly popular with homeowners and business owners because of their upscale appearance and longevity, but some people still don’t make the switch because they believe it’s difficult to keep these surfaces shiny, smooth, and free from fingerprints and cleaning marks without the help of a professional cleaning company. In truth, there are several steps you can take to keep your stainless steel appliances clean for extended periods of time. Q: Can you customize your cleaning services to meet my specific needs? A: Yes. For example, if you want specific items cleaned but other items left alone, or if you want things cleaned a certain way, we’ll adhere to your wishes. As long as you’re specific about how you want your belongings cleaned or moved, we’ll follow your directions. Q: How do you remember your customers’ special requests? A: We make a profile for each customer that includes all of their requests, and we use that information every time we come to their homes so we can make sure we’re doing everything right. Any time you want to make adjustments to your cleaning profile, we’ll sit down with you and go over everything to make sure all your requests are included. Q: Will I always have the same cleaning team at my home? A: Yes. We believe in sending the same team whenever possible. Sometimes we have to make changes if our staff changes or someone is out sick or on vacation, but the team leader and majority of the cleaning professionals always stay the same. Q: What if I need to make a change or contact my cleaning team leader? A: We’re available by phone 24/7, so you can contact us any time to change your schedule or ask questions. Most of our customers develop relationships with their team leaders, so they feel comfortable calling or texting them about their jobs. Sometimes they even call because they’re out of town and forgot to turn off the heat or lights, and we’re happy to help them with things like that. Q: Do I have to worry about theft or broken items? A: No, our employees are honest and trustworthy, and we’ve never had a problem with theft. 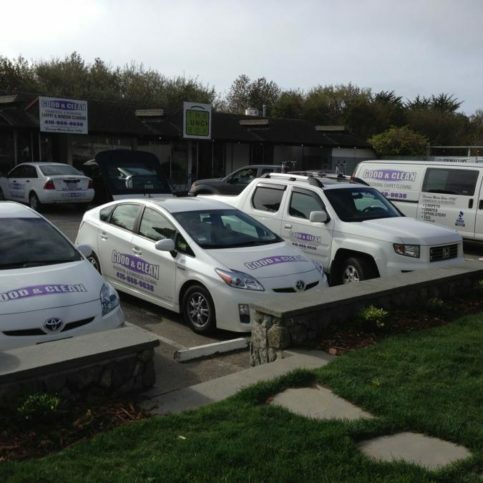 We’re very careful when we’re cleaning, but if an accident does occur, our employees are trained to report any damage. The company covers these types of damages, so they’re free to be honest about what happened. 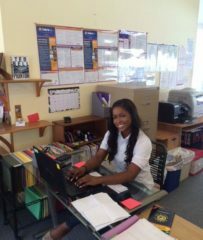 SELECTED PHOTOS FROM Good & Clean Co. Inc.
Office Manager Olivia Whitcomb keeps Good & Clean’s office fully staffed so customers can always get help. 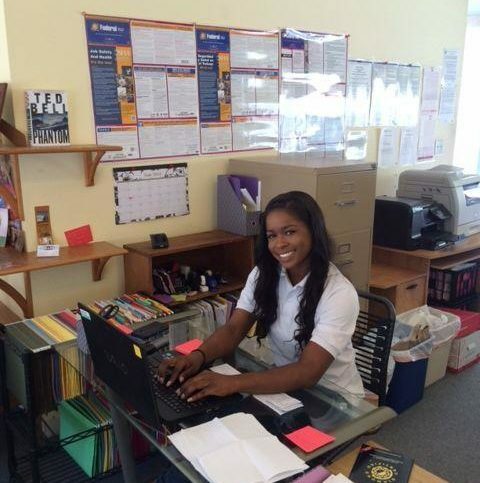 Good & Clean’s staff participates in weekly training so they can provide professional service on a continuous basis. 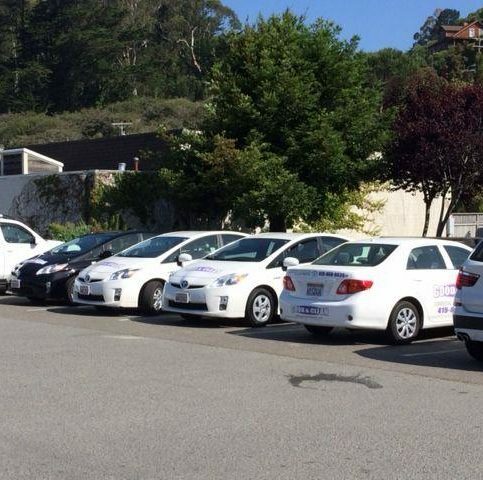 Good & Clean maintains a fleet of environmentally-friendly Toyota Priuses. This fully-equipped truck allows Good & Clean’s workers to wash windows on both commercial and residential properties. 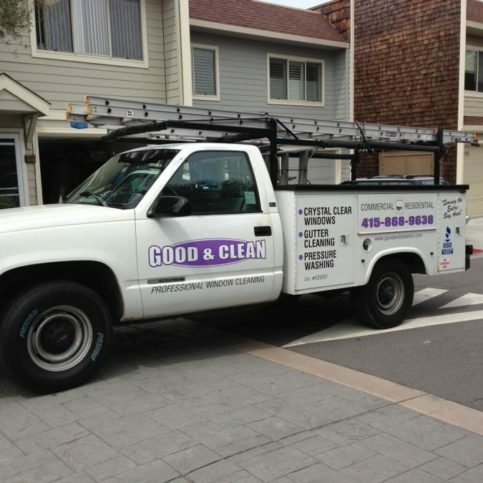 Good & Clean utilizes its fleet of service vehicles to take on all types of cleaning projects. 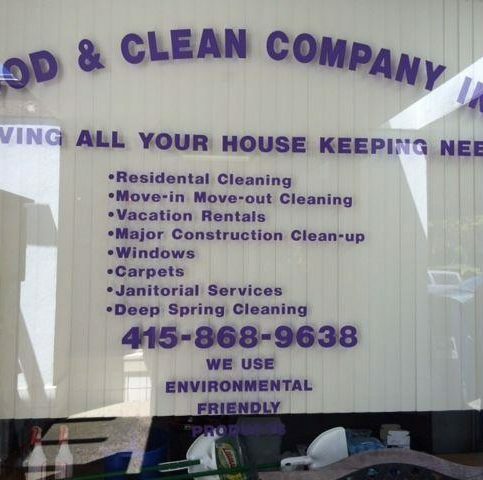 This side window of Good & Clean’s Stinson Beach office describes the company’s full range of services. Milton Gooden is owner of Good & Clean Co. Inc., a Diamond Certified company. He can be reached at (415) 231-2103 or by email. Outside of work, Milton participates in a variety of pastimes, including basketball, fitness and chess. “I love basketball—I used to coach, and I play at least three times a week,” he says. “I work out on the days that I don’t play basketball, so every day of the week I’m exercising in one form or another.” In addition to his personal hobbies, Milton takes time to keep up with his three grown children, Jeremy (who works alongside him as office manager), Joanne and Cedric. A: Both, actually—I usually go to sleep at midnight and get up around 6am. A: Forty-four, the number I wore in high school. I played football, basketball and baseball. STINSON BEACH — Manufactured from a material called chromium, stainless steel is a beautiful, durable metal that’s used in almost every kitchen. It’s resistant to stains and corrosion, but it’s not indestructible—in fact, if you use the wrong cleaning products and methods on a stainless steel surface, you can potentially damage it. There are two types of products used to polish stainless steel: oil-based and water-based. While oil-based products tend to perform better, if you’ve been cleaning your stainless steel with water-based products for some time, it’s better to stick with that. The reason is simple: oil and water don’t mix, so switching between products can create an oily film that causes streaking when you clean. Prior to polishing, it’s a good idea to perform a general cleaning of your stainless steel surface. Use a microfiber cloth to apply a mild detergent like dishwashing soap. Avoid using a sponge, steel wool or linen cloth, as these can cause surface scratches. Also, don’t clean in a circular motion; instead, clean in the direction of the grain. After thoroughly drying the surface, you can use the same procedural guidelines to apply your polish. STINSON BEACH — Host, Sarah Rutan: When it comes to cleaning stainless steel, its important to know the proper methodology. Today we’re in Stinson Beach with Diamond Certified Expert Contributor Milton Gooden of Good & Clean Company to learn how to clean stainless steel. Diamond Certified Expert Contributor, Milton Gooden: Stainless steel is a beautiful, durable metal made from chromium, which makes it stainless and resist corrosion. First, I must tell you what not to use or to do when cleaning stainless steel. You do not want to use steel wool, you do not want to use a sponge and you do not want to use a cloth with linen. You do not want to use that product with chlorine products in it. And never clean in a circular motion when cleaning stainless steel. What you’re going to want to use is a mild detergent like dishwashing soap to clean all of the excess dirt and print completely off the stainless steel. I’m using a microfiber cloth, one that’s soft and a mild dishwashing liquid like I have here and if you notice the grain is going up and down on the refrigerator and you’ll always want to clean going in the direction of the grain. Make sure it is really good and clean – pardon the pun – and then dry it completely going with the grain. Now once its dry, you can use either olive oil or baby oil if you are environmentally conscious or you can use a product like this which is an oil based product. One thing to keep in mind is there are two types of products you can buy over the counter. They are oil-based products and there is a water-based product but if you already started cleaning your stainless steel with an oil-based, stick to the oil-based. If you started with a water-based, stick to the water-based. If you mix the two together, you know water and oil don’t mix, you will create a film and it will start streaking and there will be splurges everywhere. So, I prefer oil-based. The reason I prefer oil-based is because it protects the metal longer and gives it a little bit more longevity and water will at times, you got damage to the stainless steel and water will cause corrosion on the stainless steel. Now, my next step I am going to be using a oil-based stainless steel cleaner, I put it on the rag, spray lightly and then I buff it in like so going with the grain and notice – beautiful shine. Diamond Certified RATINGS ON Good & Clean Co. Inc.
Good & Clean Co. Inc. : Average 9.0 out of 10 based on 82 unique customer surveys of customer satisfaction. They are very efficient, and they do a good job. They make a difficult job seem easy. They are kind and considerate. They were referred by my brother, and I would also refer them. I have an injury, so I have to communicate what I want sometimes, and they are very accommodating. Very prompt service, and they are really nice people. I think the work was very detailed. Overall, they provide a good service. Their estimators, they turn over their proposals quickly and they are pretty accurate. Their schedule lead times are pretty good. They make my job easy. They are a good cleaning company. They come out and make sure all your needs can be met, they are accurate with the time it will take for each visit. They are wonderful to deal with. I have been using them for a while now, but at first I would have to say that it was the quoting process. Now it is the quality of cleaning. I love when my home gets cleaned by them. They combine high quality with responsiveness. I would say, the quality of the work. I would refer them. They are conscientious, gracious, and they get the job done. They always come out when I ask them or I need them to. They communicate well. They have always been professional. They are good at scheduling and fitting me into their schedule. I have recommended them several times. They are on time and don't break stuff, pretty much all you can really hope for from cleaners. They are responsive, responsible, courteous, friendly, and very helpful. The staff was amazing and pricing was fair. They were very professional. They do a great job every week, without fail. I had confidence that they would do the job correctly. Efficient and good service, we use them a lot, their bi-weekly services. They were efficient and able to work within the limits of my schedule. They are good at what they do.